Hello! Thanks for visiting today for Just-A-Scrappin' 10-2-2014 Challenge. Make a cards, layouts, or altered art using Die Cut Inlay a great video for instructions on YouTube is Jennifer McGuire. All embellishments, paper and card stock is from my stash so I do not have all the names of the companies. 1. I started with gray card stock to cut the card base. 2. 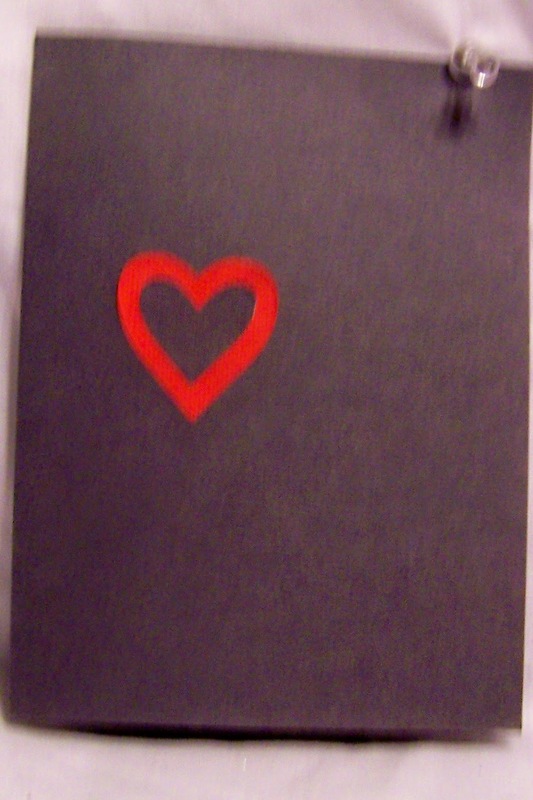 With Cricut Close to My Heart Art Philosophy I cut <Heart1>Layer at 1 1/2 inches into the gray card base and <Heart1> Layer at 1 1/2 inches in red paper. 3. On copy paper cut to fit behind the <Heart1>Layer I added lots of Tombow permanent adhesive and fixed behind the heart cut into the gray. 4. I placed the red outside <Heart1>Layer into the heart in the gray heart. 5. Next I placed the gray center <Heart1>Layer into the heart. 6. Last I adhered with Tombow permanent adhesive white paper to the card inside. Great card-isn't it nice to have a card that isn't limited by a sentiment yet-love it!